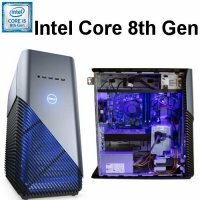 This 2018 Gaming desktop engineered with an 8th Gen Intel processor, VR-ready graphics and a striking design built for optimal cooling and powerful performance.8th Gen Intel Core processor deliver exceptional performance and headroom for split-second responsiveness and powerful multitasking capabilities. VR-ready graphics: Designed for performance and expandability, .Better boot time: High capacity SSD hard drive options for faster boot and load times on games & multi-media applications. Purposeful design: The Inspiron Gaming Desktop is designed for optimal airflow and temperatures with an optional clear window side panel with Polar Blue LED lighting.